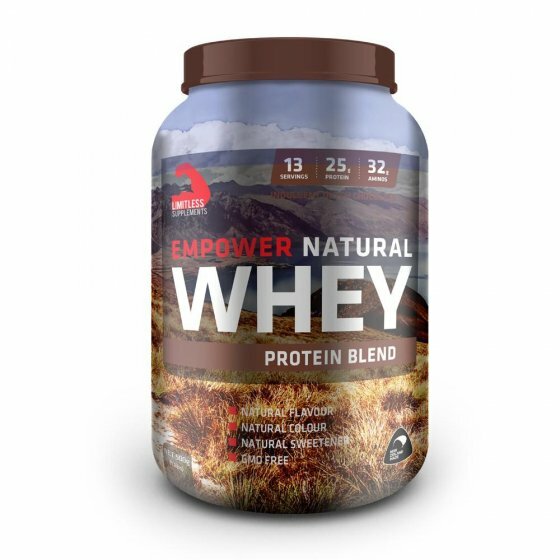 Keep up with the physical demands of a busy and active lifestyle with the Limitless Empower Natural Whey Protein. The Limitless Empower Natural Whey Protein provides a macro-nutrient enriched drink that is easily mixed and tastes great before or after your workout! The Natural Whey formula is low in calories and carbohydrates but fortified with 38gm of high-quality Whey protein per serving for optimal muscle growth and recovery. Sourced and produced to the highest New Zealand Food Health & Safety standards for assured buying confidence and quality control. Choose from 2 delicious flavours easily mixed in water or milk, Indulgent Dutch Chocolate and Vanilla Ice Cream. Try the Limitless Empower Natural Whey Protein Blend today, formulated with a distinctly clean, green New Zealand touch. *All flavours carry the same or very similar nutritional values.